While Will McMillan may not (yet) be a household name, his creativity and musical genius are more familiar than one might know. McMillan, Minister of Music at i5 City Church in Baltimore, Maryland, has collaborated with such Gospel music luminaries as Tasha Cobbs, Jason Nelson, Jonathan Nelson and William McDowell. McDowell, along with Travis Greene, has also entrusted McMillan with music director duties along the way. 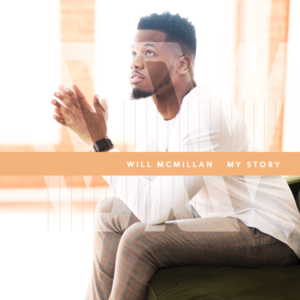 A self-taught artist and musician, McMillan’s creative sensibilities bridge tradition with a contemporary and fresh approach that appeals to Gospel music fans of all ages. McMillan’s debut album, My Story, is available from eOne Nashville. The lead single, “Best Thing,” is a remake of the James Cleveland classic, “Jesus is the Best Thing.” The elegantly sparse production make McMillan’s pure, vibrant voice – and the song’s heartfelt message – the focal point of this gorgeous rendition. “Will is one of the most humble, sincere and gentle hearted souls that I’ve had the pleasure of working with. His heart being so amazing is what makes you want to know more about his story. My Story takes listeners on a music journey that makes unexpected twists and turns, resulting in a beautiful and broad perspective of what worship music sounds and feels like. The genre has been asking: Where is the new, young, different and authentic? I am excited that we can offer them Will McMillan, and his music as an answer to that question”, says Gina Miller, VP/GM Entertainment One Nashville. This entry was posted in Gospel, Reviews and tagged Best Thing, My Story, Will McMillan by Kris Patrick. Bookmark the permalink.